This previously unreleased colour image of the planetary nebula NGC 5979 is a composite of raw FITS files made with the ESA/ESO/NASA Photoshop FITS Liberator. The image was composed from four individual exposures taken through: A blue narrow-band filter (502 nm, 460 seconds showing the forbidden OIII line), A green wide-band filter (555 nm, 240 seconds), An orange-red narrow-band filter (658 nm, 1200 seconds showing the forbidden NII line), A red, or near-infrared, wide-band filter (814 nm, 480 seconds). Stars like the Sun spend most of their life quietly converting hydrogen into helium. However when the hydrogen in the stellar core is exhausted, they start a short phase of much more rapid evolution, growing in size and brightness, to become cooler red giants that begin to eject large amounts of gas and dust as a slow stellar wind. When the star has lost most of its mass, it heats up again and brightens so that the ejected material begins to glow. 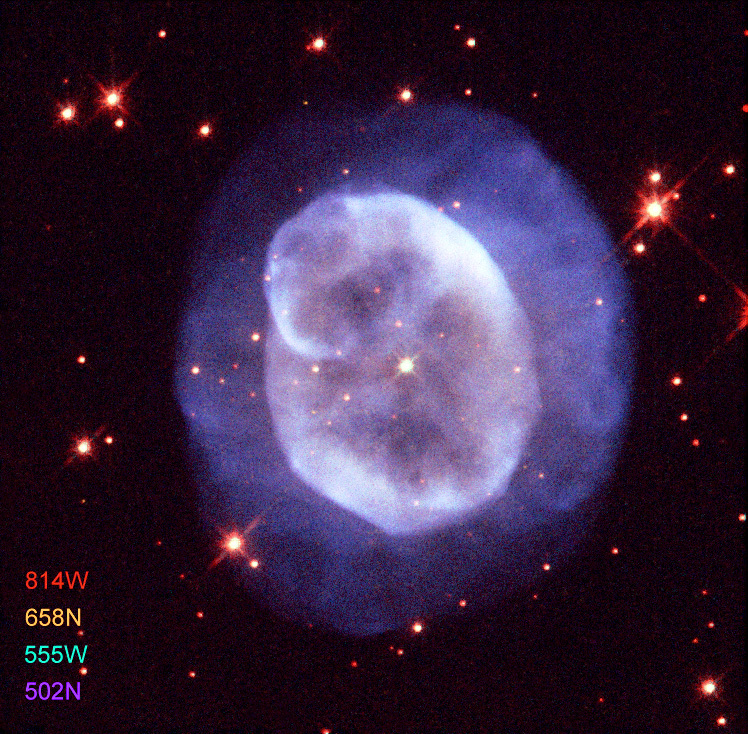 At the same time a faster wind sweeps through to clear out the cocoon of obscuring material and so a planetary nebula is born.